Kirsty and Ryan's wedding was fab! The Marriott Hotel makes a beautiful backdrop for photos, with the Racecourse in the background. I was also chuffed to bits when Kirsty and Ryan suggested going to The Millenium Bridge for photos! Luckily the weather was fine and after the ceremony Kirsty and Ryan got a lift in their wedding car to the Millenium Bridge, which is only 5 mins away from the hotel. It is a stunning structure and makes some fab pics. People walking across usually keep out of the shot, but if not, I can always edit them out afterwards! On arrival back at the hotel, we did some group shots in the hotel's gorgeous garden, then it was on to bride and groom shots, inside and out. 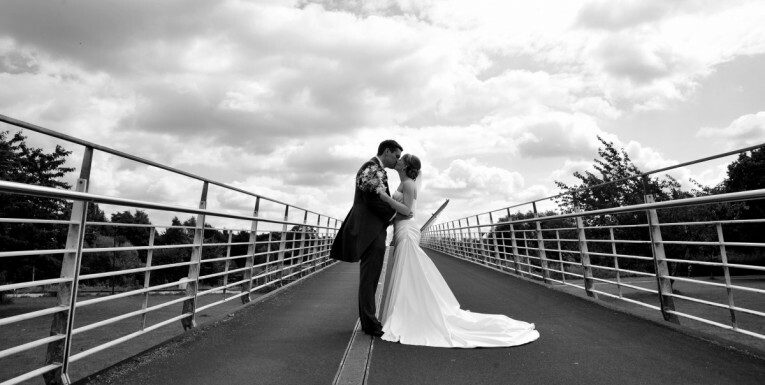 A huge thank you for the amazing photographs of our wedding day – you have truly taken some beautiful photographs. Not only did you make us both feel totally comfortable and relaxed in front of the camera but you captured some beautiful candid shots while remaining totally unobtrusive. I wouldn’t hesitate to recommend you to anybody!